So the Xenomorph is the criminal? Alright, I guess I can get behind that. Definitely don’t want to be in front of it. Not while it’s awake, anyway. I can also get behind the cat being the basket case. Ya know, since cats love sitting in basket cases. I dunno about the rest. To be honest, I really just wanna see Ridley and the Xenomorph dancing on the tables. 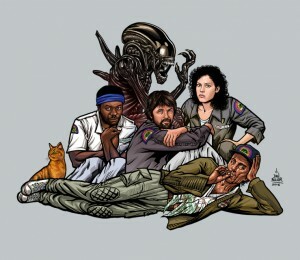 That’s the kind of Alien movie I wanna see. Wrap this cloth around your torso and dance like a Xenomorph.